the constant search for self? nah. the truth of the universe? nah. the incessant disappointment i feel everyday at many a thing? nah. i have been on a quest for the perfect pair of boots. for quite some time i believed i would never find them. i bought two pairs and returned them both, dissatisfied with their appearance in my own mirror. but fear not boot lovers, i found them. 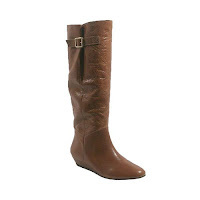 yes, last night, in my last ditch effort to find these elusive boots of mine, i visited the fashion valley mall. there, i entered the steve madden store. and immediately, i handed 3 styles of boot to the sales gal. size 8 please. i have to account for socks. first pair. eh. hank said they were decent. second pair. love. i felt it right away. hank said yar! third pair, just to be sure. nah, not so much. hank said nevah! and so, the second pair it was. hooray. if you see me on the street, tell me my boots are sweet. 'cause they is. and then ask why i'm on the street. damnit.